The 2016 U.S. Medical Eligibility Criteria for Contraceptive Use (U.S. MEC) comprises recommendations for the use of specific contraceptive methods by women and men who have certain characteristics or medical conditions. The recommendations in this report are intended to assist health care providers when they counsel women, men, and couples about contraceptive method choice. The 2016 U.S. Selected Practice Recommendations for Contraceptive Use (U.S. SPR) addresses a select group of common, yet sometimes controversial or complex, issues regarding initiation and use of specific contraceptive methods. The recommendations in this report are intended to serve as a source of clinical guidance for health care providers and provide evidence-based guidance to reduce medical barriers to contraception access and use. 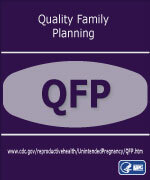 Providing Quality Family Planning Services (QFP) recommends how to provide family planning services so that individuals can achieve their desired number and spacing of children, increase the chances that a baby will be born healthy, and improve their health even if they choose to not have children. CDC has created buttons and badges to promote action and awareness for a number of health topics, campaigns, and health observances. You can become an advocate for health by posting one of the buttons or badges featured below to your Web site, blog, or social networking site. Copy this code to get the “US MEC” badge (150×180) for your site. Copy this code to get the “US SPR” badge (150×180) for your site. Copy this code to get the “QFP” badge (150×180) for your site.